Dropbox makes it much easier to work with files. You can create, store and share yours and your team's files. 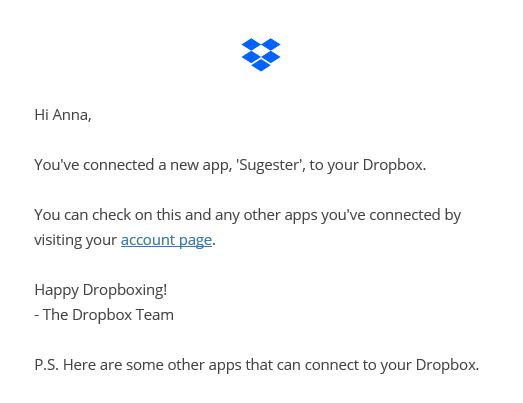 In Sugester you can add files from your computer, and from your Dropbox account. Files added from your computer are saved on Sugester's servers and you can see them at any time. However, if you add files from your computer and Dropbox account, you attach an info about it, and the file stays at Dropbox servers. It means, that if the file will be deleted from Dropbox, an info about attachment will stay in Sugester, but the file won't work and you won't be able to open it. NOTE! At the moment integration allows to add files from Dropbox to your clients in Sugester. To enable integration, select Settings > Account settings > Integrations and mark 'Integrate with Dropbox' checkbox. From now on in client's profile you can upload files from Dropbox. You can also see this integration in your Dropbox account, in 'Connected apps'.